Are you worried about how your pet will react to artificial grass? It's been proven that pets love artificial grass just as much as we do. In fact, artificial grass is actually better for pets than real grass, as it doesn't go hard or dry out in the summer months, leaving it looking unattractive and uncomfortable for pets to lie on. It doesn't get waterlogged and muddy in the rainy months, so there also won't be footprints trailing in from your garden. Artificial grass is cleaner and easier to maintain which is perfect for pet owners. Their urine will drain through the permeable surface leaving no soggy patches, and after doing their business it's easy for you to spot in the short grass length and easy to pick up. The artificial grass won't react badly to this either, meaning it'll stay in excellent condition with no stain spots or bad odours for long after it's laid and even the yellow patches from a female dogs wee wont occur! During the warmer and wetter months natural grass grows quickly meaning you need to find somewhere to confine your pet without them getting in the way. With artificial grass this problem is eliminated as the lengthy maintenance time is reduced, allowing your pet to run free all year round. The same can be said of repairing natural grass, where fertiliser can often prevent your pet from venturing into the garden. However, fertiliser leaving the garden out of bounds isn't a problem for artificial grass. Artificial grass gives you a beautiful, healthy looking lawn all year round as it won't suffer at the hands of our weather or at the paws of your pets. It's unable to be dug up like natural grass so there will be no bald spots for you to worry about. If you're looking at lawn alternatives to benefit your pet, artificial grass is the perfect option. Your pets will enjoy it just as much as you will, it won't be affected by the weather, and it won't be affected by your dog's business. Impress your neighbours with a healthy looking, clean lawn all year round and switch to artificial grass. Our latest end of roll stock clearance artificial grass. Sign up for all the latest offers, news and inspiration. © 2019 The Grass Factory Ltd – Artificial Grass Company - All rights reserved. Supply and install artificial grass throughout the UK, the perfect solution for gardens, landscapes, schools and sports surfaces. If you have any general questions about our synthetic grass products you can get in touch by email or phone. Please complete the fields below. A member of the team will be in touch shortly. Pick your free samples from the following list of quality artificial grass products, and we will send you them in the post. Your free sample request has been submitted and you’ll receive your samples shortly. See the advantages or artificial grass in our short video. Here are some pointers before you start to place your order. Firstly you need to consider the area you are covering, to ensure you are ordering the right about of grass. 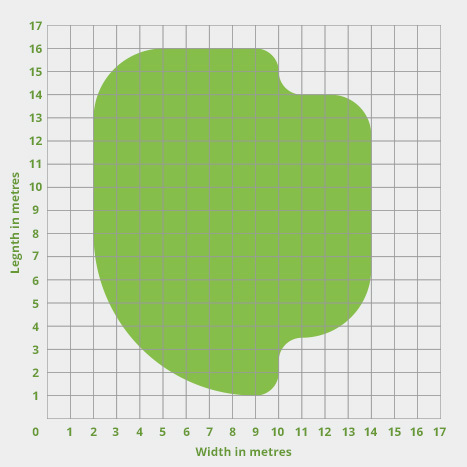 If you have a square or rectangular lawn, measuring the area is fairly easy, as you can measure two sides to obtain the square metres. When you have your measurements, you can now work out how much grass you need. Bear in mind that you can choose from 2-metre or 4-metre width rolls, as you want to aim to have as less joins as possible. Please complete the following form and a member of the team will be in touch shortly to arrange a visit.